There has been much talk of the need for a final offensive to end Islamic State (IS) control over a small strip of territory along the Euphrates River in the eastern Syrian province of Deir az-Zor. The Syrian Democratic Forces (SDF) carried out a limited offensive in May 2018 with the support of the U.S.-led coalition, advancing through desert areas and eventually capturing the Syrian side of the locality of [al-]Baghuz Tahtani right on the border with Iraq. This month, a new campaign has been launched against IS by the SDF with U.S.-led coalition support. Among the rumoured aims of this phase is the capture of the town of Hajin, which is described as the last main base of IS in the area. By now, most of Hajin's original inhabitants have fled the town. The majority of those who have fled Hajin have taken refuge in SDF areas. A number of people from Hajin have even been recruited into the SDF. To discuss Hajin further, I interviewed a person from Hajin whom I will only identify here as 'al-Muwahhid'. He himself is a critic of both the SDF and the Syrian government. This interview was conducted on 26-27 September 2018 CE. Any parenthetical insertions for clarity are in square brackets. Q: First, may I ask what is the number of inhabitants of Hajin and who are the main families in it? A: We as a people- the sons of the town of Hajin- number around 100,000 people outside and inside it. We are of Iraqi origin from the al-Obeid tribe.Our relatives are from al-Ramana [locality in western Anbar near the border with Syria]. The name of our clan is Albu Hardan: all of the people of Hajin trace their lineage back to one person who was called Hardan. They are all cousins and one clan. And those who remain inside Hajin now approximately from those who are of the original inhabitants: they number some 200 people under the control of Da'esh [Islamic State]. And there are refugees from outside Hajin who are inside Hajin and greater in number than the inhabitants of Hajin now. The inhabitants of Hajin who have remained in Hajin: some of them do not have the money to go out, and some of them have properties they cannot leave. Q: Yes. The Da'esh leadership is inside Hajin? A: The town of Hajin is the biggest of the organization's bases in Wilayat al-Furat [IS' geographic designation of the area], the line of the Syrian Jazeera. Q: But it's not the case that Abu Bakr al-Baghdadi is inside the town? A: No. Abu Bakr does not come to the areas targeted by the coalition. Abu Bakr is in the desert of Iraq's Anbar. Q: I see. Most of the people of Hajin are now inside SDF areas? Q: When did you leave Hajin? A: After the strike a year ago. Q: How was life under Da'esh before you left? A: Regarding the religion, all was fine but pressures came upon the masses and they began to be focus on the smallest thing. Second, the living condition became difficult and they prevented travel outside the areas of the Islamic State: it was not allowed for you to travel to the Gulf, Lebanon and al-Sham except with travel agreements and you had to have a medical report if you wanted to go to the doctor. But now the Kurdish SDF forces are worse than Da'esh in their dealing with the people of Hajin who have become refugees, in the camps and elsewhere. Q: Why have the Kurdish forces dealt with the people of Hajin badly? A: God knows: it's not just with the people of Hajin but also the Arab Muslim people who were under the control of Da'esh. Q: Right, so they deal with them as though they are all terrorists. Q: I wanted to ask: have many of the youth of Hajin joined the SDF? A: The area of the east Deir az-Zor countryside where the greatest number of its youth have joined the SDF is Hajin. Q: The youth of Hajin have their own battalion in the SDF? A: Yes, there are two divisions. A division with Katibat Khabat al-Sha'iti and a division with their own battalion. Q: I see, and despite the fact many of Hajin's youth have joined the SDF, the Kurdish forces deal with the refugees of the camp for hosting the people of Hajin as though they are terrorists? A: Correct. Also, they promised that the campaign on Hajin would be before al-Baghuz [Fawqani] and many of the youth of Hajin joined. When they proceeded in the campaign, they deceived them and took them to an area besides Hajin. They said to them that Hajin is filled with explosives and mines, and now the sons of Hajin are fighting Da'esh without air cover. 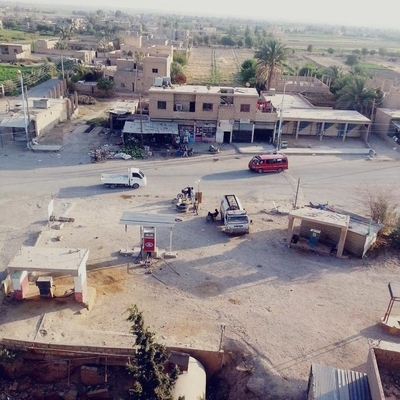 Since a week ago until now five youth from the town of Hajin have been killed in the campaign on al-Baghuz [Fawqani]. Some people from Hajin support the Syrian government. 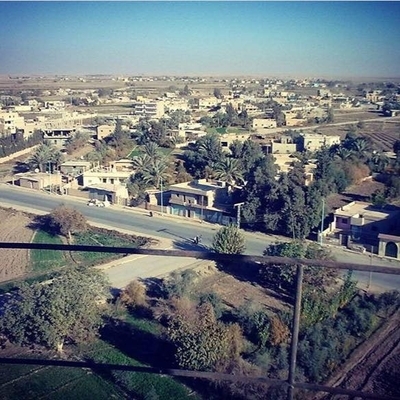 The death of Mash'al Hamoud, originally from Hajin, was announced in late July 2018. 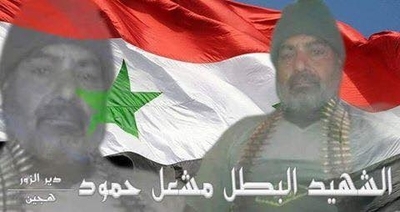 The description of him as the "heroic martyr" and featuring of the Syrian government's flag in this graphic imply he was killed while fighting for the Syrian government's forces. Some Hajeen pages appear to have been deliberately vague in reporting the circumstances of his death in order to avoid provoking internal strife among people from Hajeen. Q: In truth, if the choice is between the regime or SDF, which do you prefer? Q: Hahahaha. Which factions of the Free [Army] controlled Hajin before Da'esh? A: Liwa Ahl al-Athar. The living situation was fine and people were well. No one would obstruct you. And the oil was being pumped for the people and everything was cheap. You could travel and return with no one in your way. You could pray or not pray- no one would obstruct you. A free man. No Nusayri regime and no atheist SDF. Q: Were you in Liwa Ahl al-Athar? A: No. I did not participate in any faction. From my house to the mosque, from the mosque to my house, and praise be to God. Q: When Da'esh seized Hajin did you face any problems with them? Q: I see. And did some of the people from Hajin join Da'esh? A: Yes, and some of them were martyred [died] with them. More than 10 people. Q: Despite the dealings of the Kurdish forces with them, most of the people of Hajin prefer the SDF to the regime? **[Update 1 October 2018]: portion of the sentence beginning from "because if..." added by interviewee as a clarification.